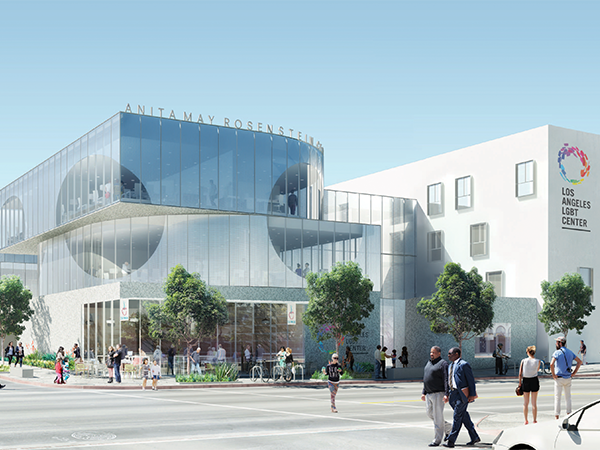 Los Angeles LGBT Center’s new Anita May Rosenstein Campus in Hollywood project will include 100 units of housing for seniors and 100 shelter beds for homeless youth. An additional 35 units of housing, along with on-site supportive services, will be made available to younger tenants, while a commercial kitchen will supply meals to tenants and those staying in the shelter space. The housing and services are aimed at members of LA’s LGBT community, but will be available to all. The new campus will also hold LGBT Center administrative offices, which will allow the Center’s current headquarters on Schrader Boulevard to become a dedicated health services facility.